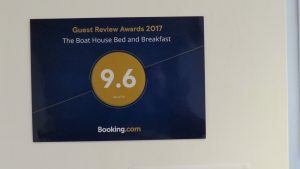 Thank you everyone who has given The Boat House b&b Laugharne a glowing review on Trip Advisor and booking.com – it’s good to hear that we’re doing a terrific job and getting a great reputation. Both of us enjoy meeting people from all over the world, it’s fascinating. Bookings for the Spring and Summer are very good so our fabulous b&b (and our hard work) is getting suitable recognition too. When we send out confirmations in future, we will also be offering our guests the chance to eat here, by prior arrangement. We will provide their favourite foods all freshly cooked without additives – plus as we’re unlicensed, those eating at The Boat House can bring their own wine etc to accompany their dinner. Our talents stretch to vegetarian food, fish dishes, international cuisine and plenty more. Just ask us for details when you book. And if you’re planning to visit Laugharne soon, contact us at The Boat House fast about accommodation, as we’re getting pretty booked up.